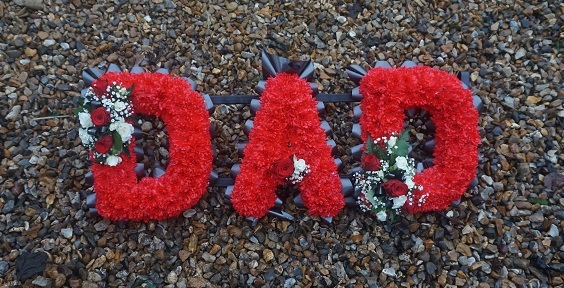 Letter tributes to spell a name or number are a popular choice for a family member or close friend. Traditionally there are two main designs to choose, either the traditional based letters or a mixed flower letter tribute. The Based design is based in white Chrysanthemums, and is edged in hand pleated ribbon in a colour co-ordinating waterproof ribbon. The spray of flowers on top of the letter is raised above the Chrysanthemums and includes a beautiful selection of Roses, spray Carnations and other flowers to complement the design. It is possible to change the white Chrysanthemums for yellow or pink flowers. A Mixed flower design is a modern twist on a traditional funeral tribute, it is full of mixed flowers, which includes Roses, Spray Carnations and other flowers which have been thoughtfully selected to complement the design. It is edged in hand pleated ribbon in a colour co-ordinating waterproof ribbon. The flowers in both designs are arranged in water retaining foam (oasis) to ensure maximum freshness. In this selection the words MUM, DAD and NAN can be ordered online. However there are no limits to what you would like, a specific name, maybe a football team or a significant number. Please contact me to discuss your requirements or a specific colour scheme.